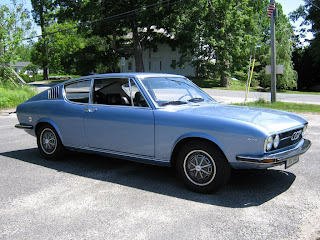 1973 Audi 100 Coupe' S - I wrote a post about this car back in November, 2009. You can read it here. Somehow, between the time I wrote that post and now, it found its way into my neck of the woods (just a few towns over, actually) and is back on the market. This is an incredibly rare car and, in my eyes, an incredibly attractive car. Located in Granville, MA, click here to see the eBay listing. 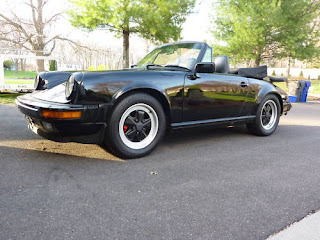 1986 Porsche 911 - There is nothing really special about this car (OK, it's a 911. That alone makes it special. Maybe I should say "There is nothing really special about this car, other than it being a 911), it's just an incredible looking car. A triple black 911 just looks nasty (in the very best sense of the word). This is a very nice, well maintained Porsche, being offered by a Porsche fanatic. Located in Suffield, CT, click here to see the eBay listing. 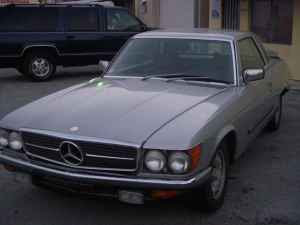 1979 Mercedes-Benz 450 SLC 5.0 - This is a very cool gray market car. Essentially, this is a 450 SLC with a 5.0 liter aluminum engine in it. "The cars differed from the stock 450SLC’s in several ways. The hood and trunk lids were made from aluminum for significant weight savings. The cars also had front and rear spoilers from the Factory that resulted in a 9 –10% reduction in wind resistance and a higher top speed. Top speed exceeded 142 mph. The motor was among the first aluminum V-8 production motors produced by Mercedes-Benz. It was lighter than the 4.5 liter iron block counterpart and produced 240 (DIN) horsepower (over 300HP in SAE HP terms commonly used today)." "The 450SLC 5.0/500SLC coupes were produced by Mercedes-Benz from 1978 to 1981 and are the rarest post-war models ever produced by Mercedes Benz. They were manufactured by Mercedes Benz to homologate the 450SLC for road rally purposes. Some cars were campaigned with factory support, but the rest of the production was sold to the European market to meet homologation guidelines. Fewer than 100 cars were imported into the United States as grey market cars during production. A few more cars were brought into the USA during the 1980’s as a one time 'personal' exemption. No one really knows how many of these cars still actually exist, but most estimates are that less than 100 road worthy 450SLC 5.0 and 500SLC’s still exist in the United States at this time." Located in South Florida, click here to see the Craigslist ad.